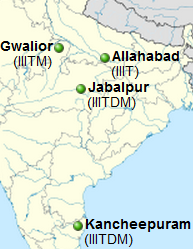 Indian Institutes of Information Technology (IIITs) are a group of four institutes of higher education in India, focused on information technology. They are established by the central government, centrally funded, and managed by the Ministry of Human Resource Development. These institutes conducted Under-Graduate and Graduate level courses, focussed on information technology. Admissions into undergraduate programmes in IIITs are through the All India Engineering Entrance Examination (AIEEE), and to PG courses is done, based on GATE exam plus other criteria. A scheme for setting up 20 new IIITs on Public Private Partnership (PPP) model has been approved by Government at a capital cost of Rs. 128.00 crore for each IIIT to be contributed in the ratio of 50:30:15 by the Central Government, the State Government and the Industry respectively (57.5:35:7.5 in the case of North Eastern region). The concerned State Government will provide 50-100 acres of land, free of cost and initially the new IIITs would be registered as Societies under the Societies Registration Act, 1860.